You can’t ignore them any longer—emoji are here to stay. Once confined to adolescent instant messages, these little cartoons now pervade our texts and social media posts. Including emoji in Tweets is shown to increase engagement by 25.4 percent over emoji-free messages, and using them in Facebook posts can increase your number of Likes by 57 percent, and comments and shares by 33 percent. With those numbers, it’s no surprise that emoji regularly pop up in online marketing campaigns. But, as with any newer digital development, businesses need to know the proper way to incorporate emoji into their branded social media strategies. To ensure your brand uses emoji in a way that helps instead of hinders your marketing efforts, we’ve put together the following guide. Never make things awkward by using that smirky face incorrectly again. One of the biggest blunders a brand can make on social media when using emoji is using them incorrectly. Don’t put that eggplant emoji in a company Tweet unless you know exactly what you are doing. You want to position your brand as an authority and in-the-know. Don’t put your company’s reputation at risk by posting an emoji that doesn’t mean what you think it means. A big fear of many social media marketers is seeming out of touch, so make sure you keep up with the latest emoji developments and meanings. A great resource is Emojipedia, which serves not only as an emoji dictionary, but also shares the latest developments and news in the emoji world. For example, when iOS 10 came out, Emojipedia published an article that showcased the new emoji and how they will look on other software platforms. While long, pre-composed emoji messages can sometimes miss the mark, a well-timed post can benefit from an emoji… or 10. To their credit, the company did follow up the release with a decoded explanation and a series of YouTube videos titled Emoji Academy, which focused on educating the public on the art of emoji decryption. While the element of intrigue certainly has worked in some companies’ favor, most people likely won’t take the time to translate something written with only emoji. Unless you can make your coded message part of a larger campaign, stick with shorter messages or equal parts text and emoji pairings. Remember, social media only works if you’re able to communicate a message clearly. Don’t leave your audience scratching their heads with your emoji use. Unless your message is somewhere along the lines of “Taking our dachshund to IKEA for some meatballs,” (although that personally sounds like a dream day to me) it’s unlikely that people will go on using custom emoji keyboards on a regular basis—which is a questionable result for so much dedicated design work. If you do decide to create your own custom emoji, instead of inventing new icons for fun, why not do it for a good cause? Take WWF, who created a set of custom emoji to represent endangered animal species. #EndangeredEmoji icons came with a specific set of instructions: whenever a user Tweeted one of the custom emoji, a donation would be made to save the animal’s real-life counterpart. Besides being adorable, this kind of custom emoji campaign gives your audience a reason to continue using the emoji in the future. You don’t have to create your own custom emoji keyboard to get people talking. Think about the reason why brands choose to include emoji in their marketing campaigns: they’re something familiar to most mobile users who use them in their everyday communications. Incorporate this habit and make your audience part of the campaign. For example, U.S. beverage brand Tampico made up a social media game that requires users to guess a winning emoji combination out of 24 options. Participants were asked to comment on the company’s social media channels with their emoji guesses and include the campaign hashtag, #TampicoEmojiball. Once the campaign was closed, the increased user engagement made it clear that Tampico was one of the big winners themselves. 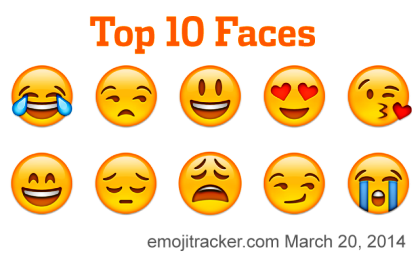 It doesn’t take too many emoji to win an award or the affection of your audience or customers. Domino’s Emoji Ordering campaign focused on a single emoji: the pizza slice. Tweeting the emoji to Domino’s official account along with a hashtag #EasyOrder allows users to place an order in a matter of seconds. The campaign combined the popularity of emoji with a new way to bring its products to customers. If you want to get people talking about your brand using emoji, give them a good reason to talk to you first. As with text messaging, a lot can get lost in translation when using emoji in professional communications. To make sure that your emoji use doesn’t end up feeling like you’re playing a digital game of ‘telephone,’ be sure that you not only know the meaning of your emoji (as mentioned above) as well as the context. Are you sending an email to your company’s CEO requesting a serious meeting? Maybe you don’t want to use the winking face emoji. Is your company’s CEO your little brother? Now that emoji could be appropriate. An important factor to consider here are demographics. Who your audience is will have a big impact on if and how you use emoji in your messaging. I would never imply that “millennials” (a word that’s like nails on the chalkboard to me) are the only ones who will respond well to your brand’s use of emoji, but you’ll need to do some audience research and testing to figure out just who you’re talking to. So if you’re an email marketer and thinking about using an emoji in one of your subject lines, try it for one week. The next week, don’t use any emoji in your email subject lines or body. Which test had higher open and click-through rates ? The same testing model can be used on social media. Pay attention to your levels of engagement and the reception from your audience when you use emoji and when you don’t. You can then use this information to drive future social media campaigns and strategies. A world without emoji is not a world I want to be a part of. Heed the advice here to get the most out of your emoji marketing campaign, and bring a little 😄 to your audience and online community.